One of the hottest trends in the Atlanta area is homeowners adding outdoor kitchens to their home. People in this part of the country enjoy a climate that is conducive for outdoor dining and entertainment. When people in Atlanta entertain al fresco, they want to make it an “event”. Whether they are watching their favorite college football game in the fall or enjoying the Dogwoods in the spring, Atlantans love their outdoor kitchens….and Granite Countertop Warehouse can make it happen with our discount granite countertops prices! Nothing brings out the nature than having granite countertops that reflect the natural elements of your backyard. Our variety of colors and giant selection of granite slabs for sale gives you the freedom to find the perfect match. If your land has pine trees, fescue, oaks or even a swimming pool, we have the colors. Additionally, people love having granite countertops for their outdoor kitchens because of the durability of the stone. Granite countertops stand up well to the rain, sun and snow. Granite countertops also do not absorb stains or odors easily and does not fade in the sun. Your backyard will be paradise granite adds luxury with convenience. 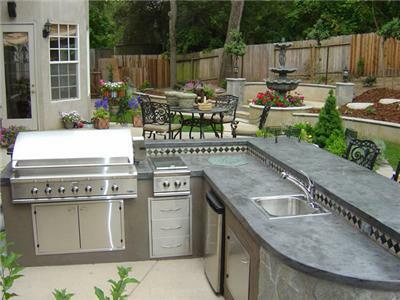 There are many brands of kitchen appliances to add to your new outdoor living area . The most popular are Viking Appliances, Wolf/Subzero and Fisher Paykel.